As the London Olympics draw near, the battle for audience attention is shaping up to be waged not on television but on the tiny screens of smartphones and tablets. Yesterday NBC announced its partnership with Adobe to roll out Olympics streaming apps for the Android and iOS platforms in the U.S. Today, the BBC has announced its own Olympics app for the two mobile platforms as well as BlackBerry devices. The main function of the app will allow users to receive up to 24 live streams of Olympics coverage over Wi-Fi and 3G signals. Also included will be editorial text from BBC news commentators, dedicated pages for every athlete, country, and sport, schedule information, and a medals chart to allow users to keep track of the winners. "We needed to ensure everyone could access our coverage," BBC News general manager Phil Fearnley said in a statement. 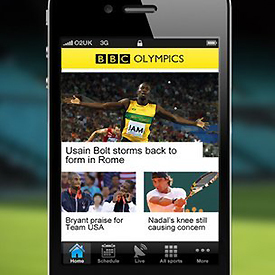 "The BBC Sport Olympics app ensures that everything you need to keep up-to-date with the action is right there at your fingertips. Even when you're out of range of 3G or wireless, we'll still be able to deliver the latest news to you offline." The "out of range" component Fearnley mentions refers to the app's automatic downloading of content for consumption when a user's device isn't connected to the Internet, a feature that can be disabled in order to save battery life or cut down on data charges. The iOS version of the app allows a user to customize the app to focus on one particular Olympic sport. Finally, there's also a social media component of the app that lets a user email or share stories directly from the app. So far the app, which is a free download, has received high marks in Google Play, with some users saying the app is better than even the official London Olympics app.